I can’t help it. I love to experiment with recipes. But when it comes to canning, experimentation is not always a good idea. For safety sake, my canning recipes are usually just very minimal tweaks to recipes that I trust. 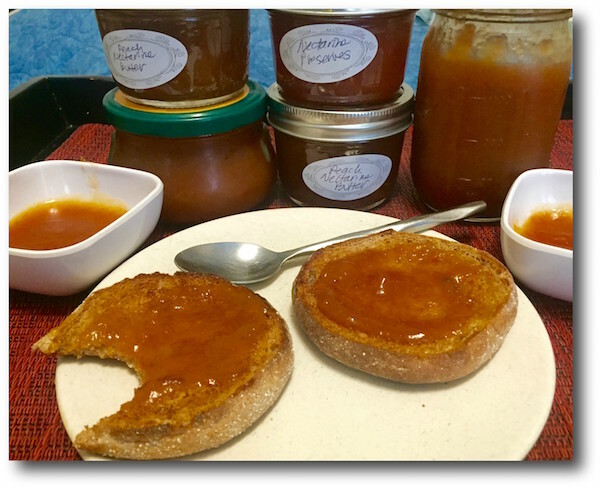 When my second batch of fruit from Washington State Stone Fruit arrived last week I made low sugar nectarine preserves from one of my pal Sean Timberlake’s recipes. Sean is the brains behind the do-it-yourself site Punk Domestics and a canning expert. I also made a combination peach and nectarine butter from another recipe I’d used in the past. With Sean’s reassurance, I used a tablespoon of Grand Poppy amaro in the nectarine preserves, and just a teaspoon of saffron bitters in the fruit butter. You don’t really taste it in either, but it adds lovely aromatic properties. With the preserves recipe I didn’t use any liquid with the nectarines because some of the fruit was very juicy. If you’re wondering about Grand Poppy, it’s an amaro that’s bittersweet and includes California poppy, orange, lemon, grapefruit, bearberry, California bay leaf, pink peppercorn, dandelion, blessed thistle, burdock, rue, artichoke, gentian, geranium, cherry bark and a bit of cane sugar. Place the peaches and nectarines in a large pot with the water, lemon zest and lemon juice. Cook it over medium heat until the fruit is very tender. Use a stick blender to puree the mixture. Add the sugar and simmer for 30 minutes or until thick enough to cling onto a spoon. Add the bitters and stir. Lade into hot prepared jars (washed with hot soapy water). Leave 1/4 inch head space, wipe the rim of the jar if necessary. Apply the lid and twist on the band. Gently place in your canner or a large pot of water with a rack in it. The water should be 2 inches above the jars. Cover and boil for 10 minutes. Let cool for 5 minutes then remove let cool. Disclaimer: My thanks to Washington State Stone Fruit for the fruit and to Greenbar Distillery for the bitters and amaro. For more preserving recipes, check out Sweet Preservation. The 4th of July is a holiday that calls for the bold red, white and blue colors of the American Flag. It’s easy to find decorations in these colors if you’re having a backyard barbecue or pool party and want to create a festive atmosphere, but it is difficult to find food in these colors in foods. Fortunately, while a little bit of food coloring can help give a dessert a patriotic look easily, you can find these colors in fruits that celebrate the summer. A selection of fresh fruit desserts made with red strawberries, raspberries and cherries alongside desserts made with blueberries can capture the red, white and blue look of the holiday with no food coloring needed. The added bonus is that you will also be enjoying some of the best berries of the year when they are at the peak of their seasons! A Mixed Berry and Mascarpone Tart is an easy to make tart the features a no-bake filling and is studded with rows of fresh fruit. You can use any fruit of your choice, but berries of all colors make the tart look absolutely stunning. Strawberry Shortcakes are a common summer dessert, but they are not the only fruit that can make a great shortcake. Double Blueberry Shortcakes feature blueberry shortcakes and are filled with whipped cream and more fresh berries. Fruit cobblers are always a welcome dessert in the summer. A Peach and Strawberry Cobbler uses a combination of fruits that you don’t usually find in a cobbler and, while it is not red and blue, it has a beautiful color to it that captures a summer sunset. Blueberry Pudding Cake is similar to a fruit cobbler, but with a thicker layer of berries at the bottom that takes on a sauce-like consistency as the cake bakes. For blueberry fans, this is dangerously addictive. For strawberry fans, a Fresh Strawberry Pie is a good choice. The pie bursting with color and packed with fresh strawberries, which are topped with a thin strawberry glaze that gives the pie a glossy finish and adds an extra hint of sweetness to already sweet berries. Red, White and Blue Push Pop Cakes are like individual berry trifles, with layers of cake, whipped cream, red strawberries and fresh blueberries. Served in special push pop containers, these treats look just as festive as they taste. Red White and Blueberry Yogurt Cake is another dessert that really captures the colors of the holiday. The tender white cake is packed with blueberries and raspberries, which really pop against the white crumb of the cake. It has just a thin layer of cream cheese frosting on top and is garnished with fresh berries. I love pies made with fresh fruit in the summer, but hand pies are even better in my book. 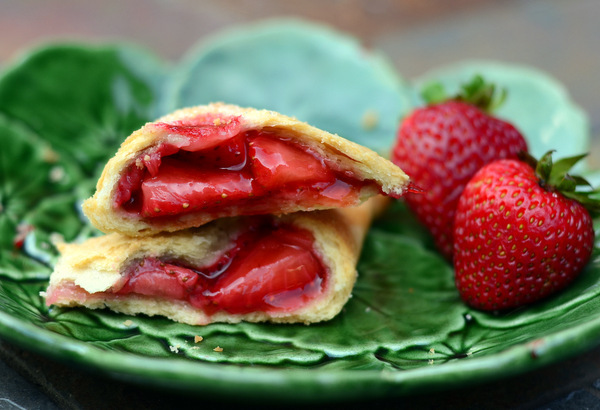 These Strawberry Hand Pies are easy to make and perfectly shareable. That means that no plates or silverware are needed to serve these, making them an exceptional choice for barbecues and picnics all summer long. 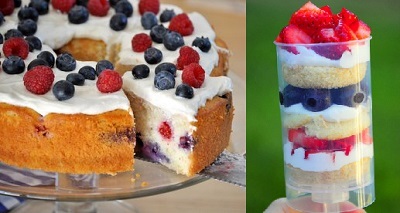 The post Naturally Colorful Fruit Desserts for the 4th of July appeared first on Baking Bites. The Kilner butter churn offers everyone the easy way to make their own delicious homemade butter, and makes a stylish addition to any kitchen. Simply place whipping cream into the butter churn, turn the handle, and in as little as ten minutes you can enjoy fresh and natural tasting butter. Included within the set is easy to follow step by step instructions as well as a selection of recipes. The Kilner business was first established by John Kilner in the 1840’s in England. Initially producing glass bottles and jars, it was towards the end of the 19th century when the original Kilner Jar was first invented. The original Kilner jar is as much-loved and successful now as it was 120 years ago. Its long-lasting popularity is owed to its distinctive pressure seal and iconic design. Put simply, households all over the world trust it to successfully preserve and pickle their fruit and vegetables. In the 1900’s, Kilner presented its innovation as ‘the original and the best, all other brands are substitutes’, a claim which remains relevant today, and is a testament to its impressive heritage. It’s not often that you come across a new vegetable. The first time I saw Fioretto at a market in Chinatown I thought it must be some kind of weird overgrown cauliflower. 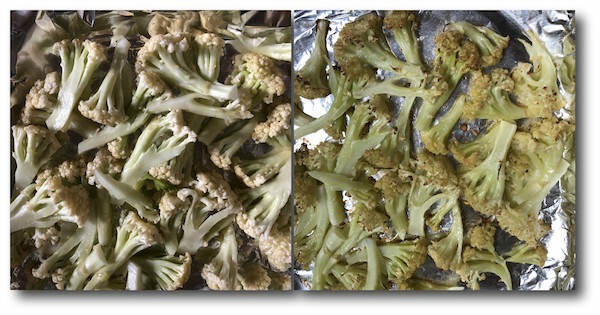 It turns out it’s a relatively new hybrid that combines the best of broccoli and cauliflower. In addition to Fioretto, it’s also called stick cauliflower, flowering cauliflower, Chinese cauliflower and kaurifurore. 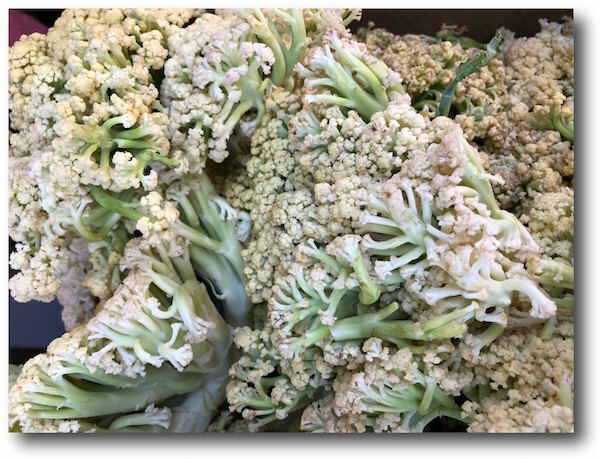 It has thinner sweeter tops than cauliflower, and stems similar to broccoli which are sometimes white and other times pale green. The stems deepen in color when cooked. The hybrid was developed in Japan in 2012 by a seed company and I started noticing it the past year or so but couldn’t find much information about it. Once I tried cooking it, I became a fan. Because it’s less dense, it’s easy to cook and lends itself well to raw, steamed or stir fried recipes. One of the ways I particularly like preparing it is by roasting it with olive oil, salt and garlic. 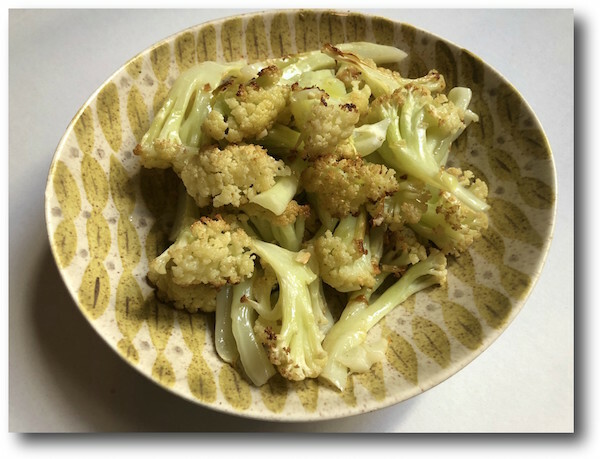 Like traditional cauliflower it develops a very appealing sweet flavor when cooked. It’s a great side dish, but also good tossed with pasta or in a roasted vegetable salad served either warm or at room temperature. I’ve seen Fioretto at both farmer’s markets and frequently in Asian produce markets and it’s also distributed by Melissa’s and Specialty Produce. Like other brassicas it’s high in vitamin C, dietary fiber and potassium. If you’ve tried it, let me know in the comments. Preheat oven to 400 degrees. Break the vegetable into bite sized florets and toss in a bowl with olive oil, garlic and salt. Place on a foil lined rimmed baking sheet and bake for 20 minutes or until tender and brown in spots. Book 1 of 5 in the Five Ingredient Cooking Series: Collect them all! Hannie P. Scott is a best-selling author that knows a thing or two about cooking! Cooking and experimenting with foods is her life passion. Driven by her desire for cooking for others (and herself), Hannie spends a lot of time in the kitchen. She enjoys sharing her love of food with the world by creating “no-nonsense” recipe books that anyone can use. You can find cooking tips, advice, and recipes on her blog, www.Hanniepscott.com. Scroll up and click ‘buy’ to start enjoying these delicious meals today!